French Easter Pâques Activities: Pâques Scavenger Hunt Game - La Chasse aux Mots - Vocabulary Game. (24 French Easter Pâques Vocabulary to practice) All Ready to print - No prep! Looking for a fun activity for French Easter Pâques? This is a great way for students to learn/review the French Easter Pâques' Day vocabulary. What a great way to learn the new vocabulary of Pâques! Hide the 24 cute word wall cards in the classroom and enjoy watching your students playing this classic Scavenger Hunt game! 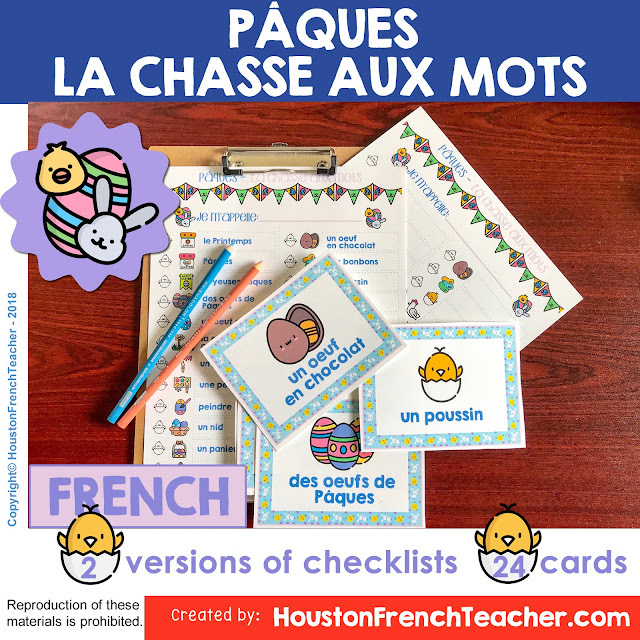 This French Easter Pâques Activities: PâquesFrench Easter Pâques Activities: Pâques Game Activity includes two versions of checklist. It's differentiated for younger/older kids. Older students will need to write the new vocabulary on their answer sheet. Once you are done playing the game, you can keep the cards as word wall in your classroom. Great fun and super cute decorations for your classroom!